Bentley unveiled the 243,000 euro ($335,000) Continental Supersports ISR, which set a new world record last month in driving on ice at 330.7 kilometers per hour (206 miles per hour). GENEVA (Bloomberg) – Bentley, Bugatti and Maserati are flaunting some of the most extravagant and powerful vehicles they've ever made at the Geneva auto show this week as the super rich in the U.S. and China resume spending. Bentley unveiled the 243,000 euro ($335,000) Continental Supersports ISR, which set a new world record last month in driving on ice at 330.7 kilometers per hour (206 miles per hour). Bugatti put three models on display, including the Super Sport priced at 1.9 million euros. "The number of wealthy buyers worldwide is clearly on the rise," Wolfgang Duerheimer, CEO of Bentley and Bugatti, both part of Volkswagen AG's stable of ultra-luxury brands, said Tuesday in an interview. "It's a suitable time for new products. The barometer is pointing up. Rolls-Royce Motor Cars Ltd. the ultra-luxury unit of BMW AG, is considering the introduction of a derivative of its $245,000 Ghost model line in 2014, the unit's CEO Torsten Mueller-Oetvoes said in an interview. "The Ghost brought us a lot of new people that we've never seen before," Mueller-Oetvoes said in Geneva Wednesday. "I'm quite positive that we'll see further signs of recovery." Average customers of Rolls-Royce $245,000 Ghost are about 45 years old, 10 years younger than those of the Phantom, which retails for $380,000. While sales of the larger model remained stable compared with about 1,000 cars sold in 2009, Roll-Royce's sales growth to 2,711 units was driven by the Ghost. 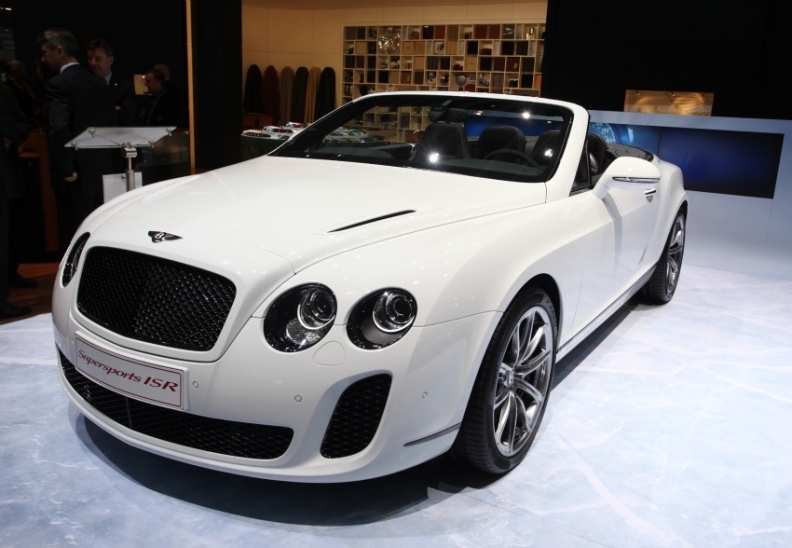 Sales of supercars like the Bentley ISR are growing amid renewed optimism in the finance industry after the U.S. economy expanded 2.9 percent last year, the most in five years. Supercar sales are growing amid renewed optimism in the finance industry after the U.S. economy expanded 2.9 percent last year, the most in five years. Lamborghini, another VW division which is presenting the 700-horsepower Aventador, its most powerful serial model ever, may sell more vehicles in China than in the U.S. this year, according to CEO Stephan Winkelmann. Deliveries in the U.S., the top market for the most expensive cars, may surge 146 percent in 2011 for vehicles costing from $200,000 to $400,000, according to Lexington, Massachusetts-based IHS Automotive. China, the world's biggest auto market, will remain the fastest growing major economy in 2011, with a 9.6 percent expansion, the International Monetary Fund predicts. "The Asia-Pacific area only suffered a little drop" during the economic recession, Winkelmann said in an interview in Geneva. "The super-luxury market is coming back." While Winkelmann says the 255,000 euro Aventador will be "one of the main drivers" of public attention, Lamborghini will have to compete with models made by Maserati and Ferrari at the annual auto show. Maserati is presenting its GranCabrio Sport, a sportier version of its GranCabrio with a top speed of 285 kilometers per hour. The manufacturer is starting to collect orders for the 450-horsepower vehicle, which will be on sale from September. Maserati plans to further boost sales in China, where its deliveries rose 54 percent last year, outpacing a 47 percent increase in the U.S. Both manufacturers belong to Fiat S.p.A.
Maserati, will begin to deliver its top- of-the-line GranTurismo MC Stradale this month. The company already sold out the first 200 of the 156,000 euro flagship model. The car surges to 100 kilometers per hour in 4.6 seconds and has a top speed of 301 kilometers per hour. "At the top of the market the overall trend globally looks to be good, helped by improvements in the mature economies such as the U.S. and western Europe alongside growth in China, the Middle East and Russia," said Ian Fletcher, an analyst at IHS Automotive in London. Ferrari unveiled the four-seat 260,000 euro FF, its first four-wheel drive model. The company aims to build 800 FFs annually, with the first year of production already sold out, Chairman Luca Cordero di Montezemolo said Tuesday. "Lower down the scale, the McLaren MP4-12C will find a customer in those who perhaps want something that isn't the Ferrari F430," said Fletcher. "The Bentley Continental GT has also got a bit of a following now and this is likely to carry on with the new next generation." Bentley's 640-horsepower ISR model will be limited to 100 units, Duerheimer said, forecasting the series may be sold out by the summer. Bugatti has now sold 294 Veyron supercars and orders for the remaining six vehicles may be given away in Geneva, the CEO said. "The ISR is like a raging bull," Duerheimer said. "I'm pretty confident it will sell fairly quickly."